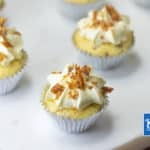 These low-carb Keto Maple Bacon Cupcakes are simply divine! They're the perfect combination of salty and sweet in one mouthful. It's true what you've heard; "everything does taste better with bacon." In a large bowl add the bacon grease, sweetener and bacon. Mix well. Add the remaining cake ingredients and mix well, until fully combined. Line a mini muffin tin with cupcake papers and fill each 3 quarters full. Bake for 15-18 minutes, until the cakes spring back when touched. Set aside to cool. In a large mixing bowl, add the butter, icing mixture and maple syrup and whip with a hand mixer. Starting on low speed to prevent sprinkling icing mixture around the room. Whip until light and fluffy. Spoon the frosting in a piping bag with a star nozzle and pipe onto the cupcakes. Top each cupcake with a sprinkle of the finely chopped bacon.